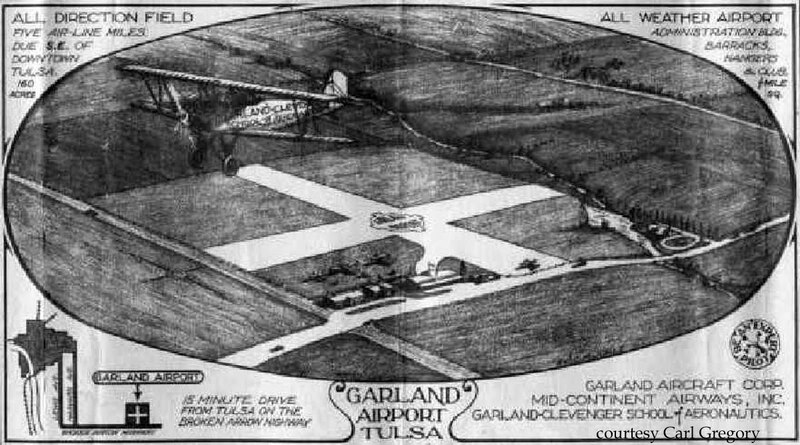 Robert Garland opened his own airport on the northeast corner of 51st and Sheridan back in 1929. 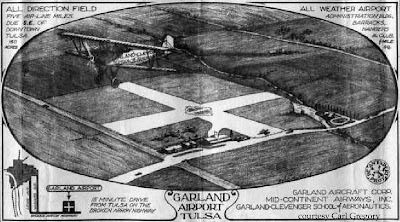 The field later became Garland-Clevenger Airport. 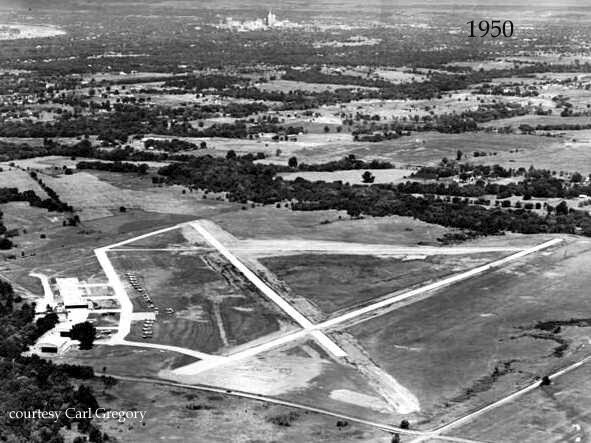 Described as an auxiliary airfield, it was used as a practice field for Spartan Aeronautics during World War II. However, a year later it was renamed again. 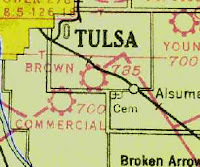 Walter E. Brown had lived in Tulsa since 1916. 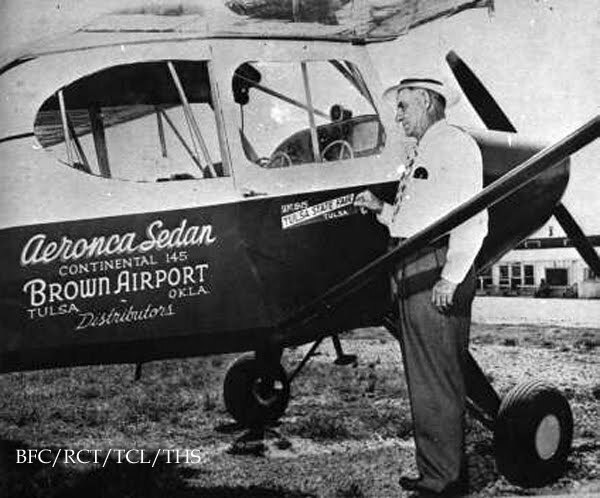 He took his first solo flight in 1922 and loved flying. After serving as a bank president and an oil executive, he acquired the Mayo airfield and facilities in 1946, owning it's lease until 1949. He constructed several hangers on the 160 acre airport and operated Browns Flying Service. After he retired, it was still called Brown Airport. 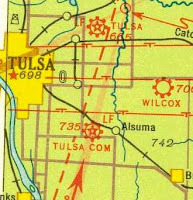 In 1962 the field was said to offer fuel, major repairs, charter flights and was listed as the Tulsa Airport Company. *One pilot recalled there being a drive-in theater across the street that served as a marker of sorts to the pilots. The entire area was sold and by 1964 was turned into the Park Plaza housing addition. 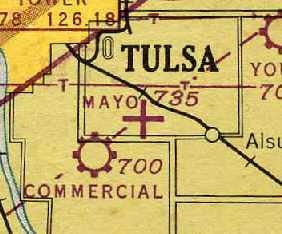 The 1937 Airport Directory lists Tulsa Commercial Airport as being 5.5 southeast of Tulsa, having a 2,640 sod landing area with "Commercial Airport" and "Tulsa" painted on the roof. This airfield also handled Army flight operations during the war at which time it gained 2 paved runways. 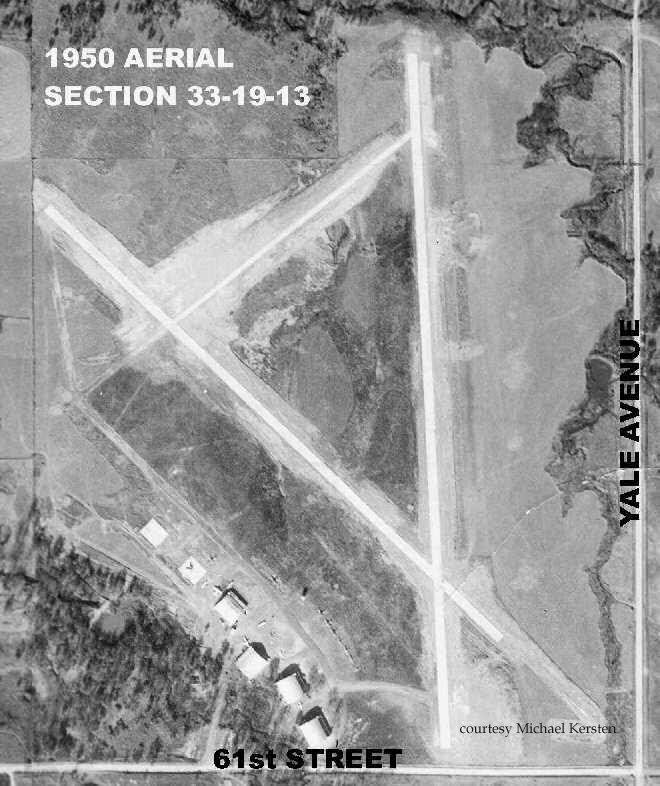 In a 1950 aerial photo you can see the four hangars on the south side of the field. The housing addition, Holliday Hills, was soon constructed as well as a shopping center by the same name. However, the main north/south runway was kept as a street (Urbana) and used to have some airport markings on the concrete. 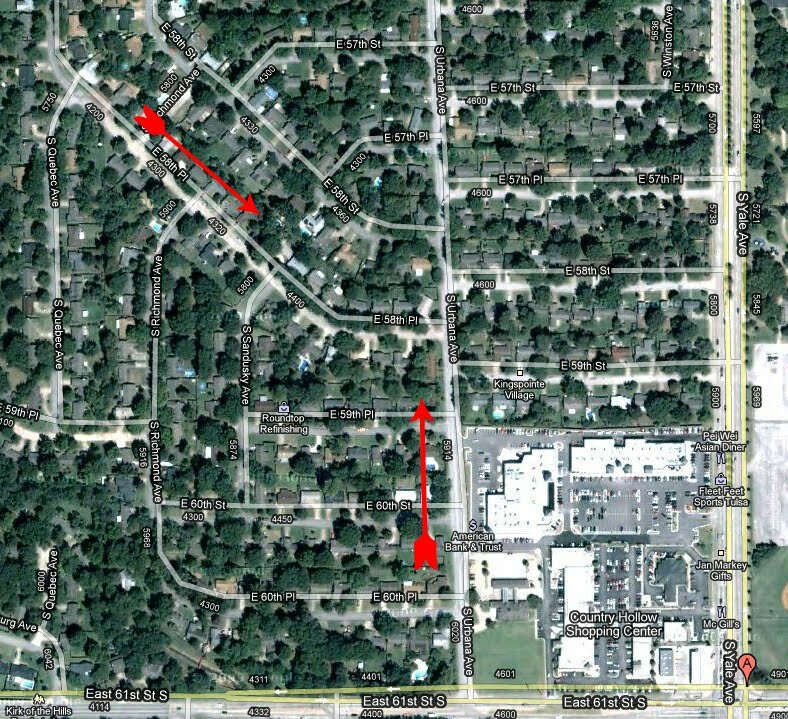 The crosswind runway (58th Place) was also largely left intact with each end of it being modified and redirected into other streets. was built sometime between 1944-1945. 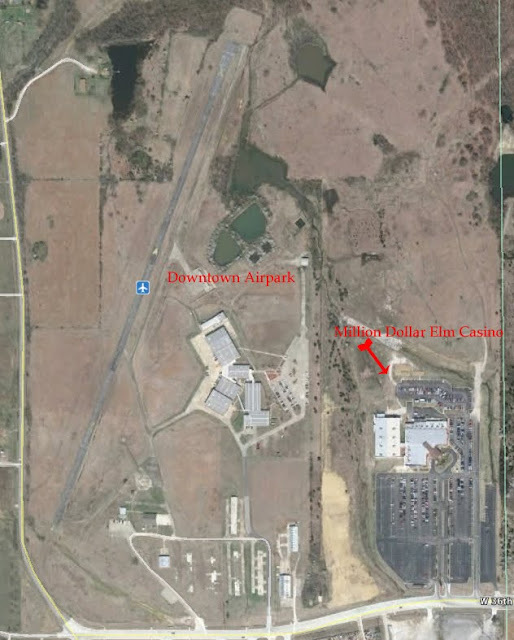 Located off North Osage Drive and East 36th Street North (close by the casino) various sources describe the airport as having a 2,500' unpaved runway in 1949 and in 1950 as having 4 runways. By 1955 it was described as being 2,100'. During this time there were drag races going on at Tulsa North which were said to have been responsible for tearing up the asphalt on one end of it. 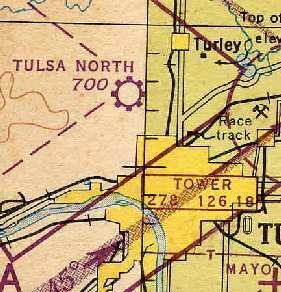 In 1962 the operator of the airport was listed as A.E. Kobel with the name changed to Downtown Airpark, by which it is still known. Allied Helicopter Service formed a flight school here in 1966. It was owned by Tulsa Technology Center until 2006 when it was sold to an investor group. 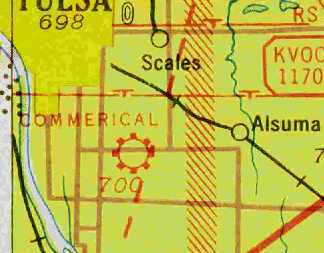 In an ironic and historic turn, the 100 acre property- which was within the original allotment of Osage Chief Peter Bigheart- was purchased by The Osage Nation in 2008. Thanks for pointing out my typo John! Got it fixed. 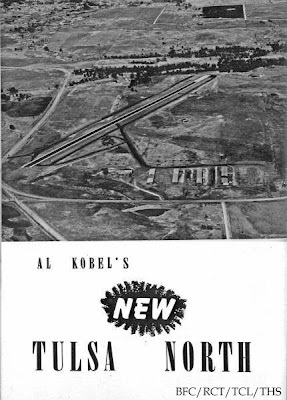 When I was in high school a friend and I hitched from Wagoner to Tulsa to see the drag races at the North Airport. 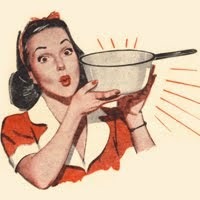 That was in 1957 or 1958. I was born and raised in T-Town and fondly remember so many of the locations depicted in your wonderful blog. I used to live in Holiday HIlls just west of 56th street and Urbana and remember thinking how cool it was to live in a neighborhood with streets that actually used to be Commercial Airport runways! I am a Tulsa history buff and truly enjoy learning about its rich and beautifully historic past. I hope some day to become an active part of its preservation. I doubt drag races "tore up" the north airport. To the contrary. I interviewed Weldon Christian in the early '90's, he was a member of the Tulsa Timing association that made a deal with the airport operators to pave the airport in exchange for being able to use it every other Sunday for drag races. Weldon says they paved the first half with concrete and the last half with asphalt, I understand until then it was grass. Weldon further said that even though the races had paved the airport, the aviators insisted on using the strip on the race dates, going against the agreement. My family moved from North Tulsa to 51st and Sheridan in 1964 when practically nothing existed south of 51st street or east of Sheridan. Although Brown Airport had ceased, there were two wrecked airplanes left in the vacant field for us to play on. If I recall correctly, one was an old air force jet and the other was something similar to a Cessna. What terrific memories. We lived in Holiday Hills just off Urbana. 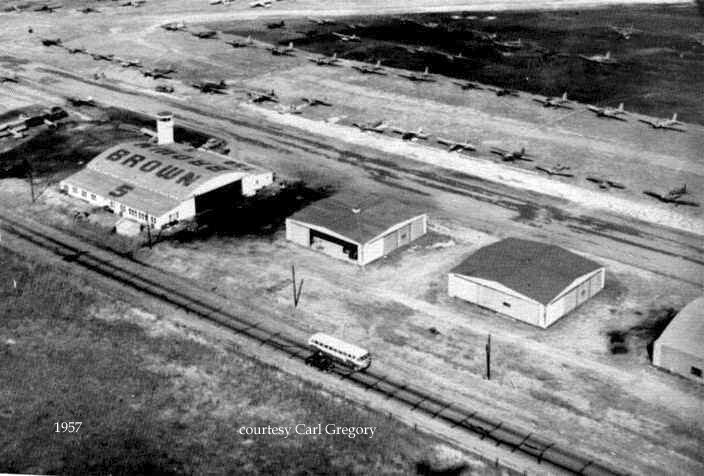 In '59-'61 we used to ride bikes over to Brown to play on a WWII airplane - the cockpit was open and you could get inside - it was great fun! I think it was a Navy TBF Avenger torpedo bomber, but a variant in which the bomb bay had been modified to have an extra crew compartment, maybe for recon or photography. If anyone has more information about this particular plane I'd appreciate it. Tulsa has a rich heritage in the aviation field from many early fields such as Paul Arbon's field, Harold Breen's airfield, McIntyre' different locations, and the old Curtiss Southwest field to more contemporary fields such as 15th Street Airpark, Wilcox airfield, and Western Airpark. This and the Lost and Abandoned Airfields blog by Freeman are well worth monitoring. We recently submitted the Wilcox field on Freeman’s site. Sometimes, in error, Wilcox field is referred to as Collier field. Wilcox owned the field and Collier had a flight school and airplane manufacturing facility at that site. 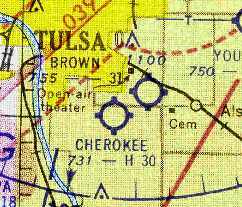 I am always glad to see and read Tulsa's wonderful history. This is a great site for that purpose. It is also a good way to spend a Saturday or weekday by going by the Tulsa Air and Space Museum. Don't forget 81st Street Airpark at East 81st St and South Mingo Rd! 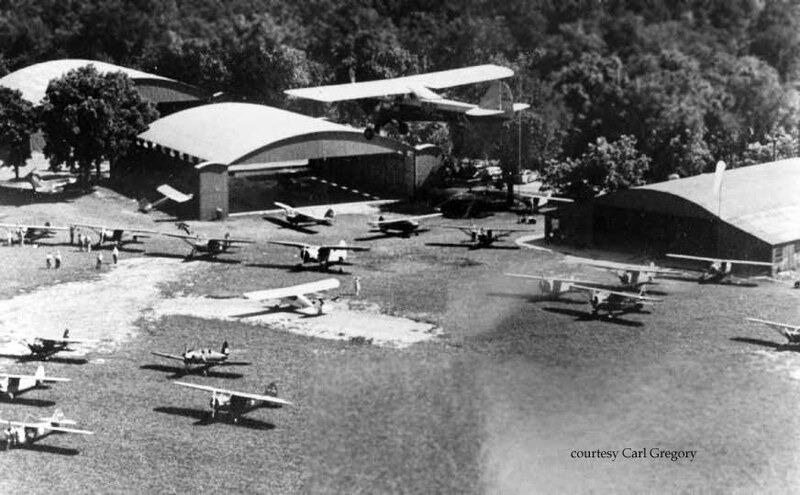 When I was learning to fly with the Air Explorers out of Harvey Young Airport, we used to fly our Cessna 150 over to 81st St to practice short field landings since the runway was only about 1100 feet long. 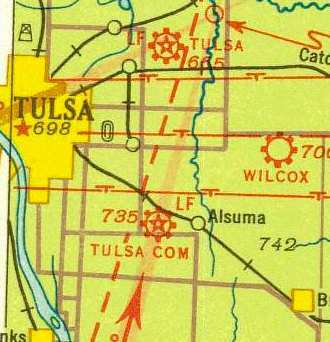 It was still there and in limited operation after Tulsa Junior College opened their southeast campus, if I recall correctly. Even after it closed and those big houses were built over the runway, the hangars and some stranded airplanes persisted for some years until commercial development swallowed the rest of the corner. Does anyone have any information about the name of the 81st Street airport? TCC is collecting interesting stories for the 30th anniversary of our Southeast campus. 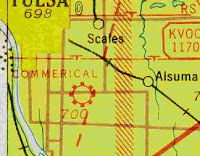 The airport to the south of 81st and east of Mingo was still operating in 1994 when I was hired at TCC's Southeast Campus. I'll never forget the morning I was driving to the campus and a fairly low flying plane crossed 81st Street right in front of my car, on it's way to land. 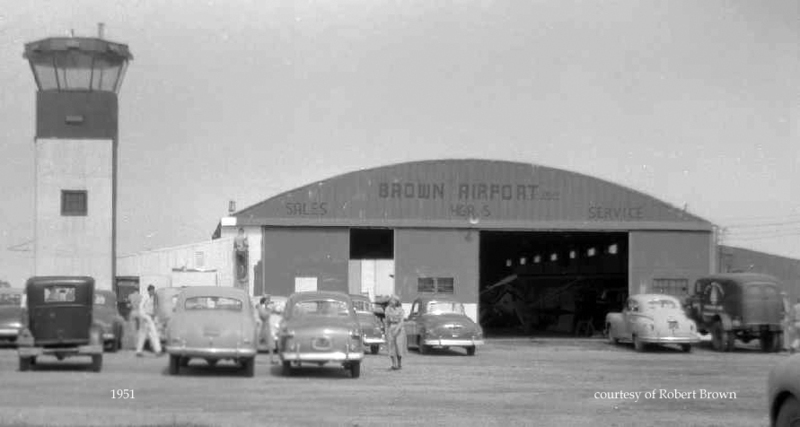 The two old aircraft at Brown were a pair of North American O-47 observation aircraft developed in the late 1930's. I believe at least one of these aircraft was moved up to Olathe, KS and eventually acquired by the USAF Museum in Dayton, OH. My brother and I used to play in the old O-47A in the early 1960's We would get some "Boston Baked Beans" which were maroon-colored candy covered peanuts from Brown's airport and play for hours in the planes. My brother was the supposed pilot and I was the ersatz bombardier. You could still crank the glassless doors open on the bottom of the fuselage. It was probably 100 degrees in there during the summer but we had a blast. There was also a functioning experimental aircraft there that was made by a friend of both our uncle and father. As I recall, it was a crazy green and it seems I heard that it had a VW engine. I believe the experimental aircraft was Don Gallbraith's Druine Turbulent, built by Don. Green, with a VW engine. I flew it off Brown's a few times.